Ministers have defended plans to tighten the rules on strike ballots after unions said they would make legal strikes "almost impossible". Under current rules all that is needed for a strike is a simple majority of those that take part in a ballot. But the Trade Union Bill would impose a minimum 50% turnout - and public sector strikes would need the backing of at least 40% of those eligible to vote. All four Labour leadership contenders have criticised the proposals. David Cameron and Harriet Harman clashed over the issue at Prime Minister's Questions, with the Labour leader accusing the government of "attacking the right of working people to have a say on their pay and conditions". But the prime minister said Labour's opposition showed it was "utterly in hock" to the trade unions. The public, he argued, were behind Conservative efforts to ensure strikes were only called as "a last resort" and "to sort this out for working families". The Trade Union Bill, which began its journey into law by being presented into the Commons on Wednesday, represents the biggest shake-up in the rules on industrial action in 30 years. The new laws would force unions to give employers 14 days notice of strike action and allow them to bring in agency staff to cover for striking workers. The legislation could also cut the amount of money unions have to mount campaigns - or donate to parties such as Labour - with members actively having to "opt in" to pay the so-called political levy, which is currently automatic unless members opt-out. But proposals to ban picket lines of more than six people appear to have been dropped. It will be made an offence not to have a named individual supervising a picket line. The legislation also includes efforts to tackle "intimidation" of non-striking workers. These are some of the most sweeping and radical union reforms since the 1980s. The unions fear it will make effective industrial action pretty much impossible - and say it's unnecessary as the level of strikes is almost at its lowest ever. But ministers argue that in the wake of strikes on London Underground, for example, where people have been severely inconvenienced, they need to find a fresh balance and look again at the power of the trade unions. What is notable is that when Margaret Thatcher introduced her reforms, it was on back of a wave of industrial discontent. Today, unions are much diminished and tamed beasts which has promoted accusations from the unions and the Labour Party that this is all partisan politics designed to nobble them. A number of unions involved with the last major day of nationwide strike action in July 2014 would have fallen foul of the 50% turnout rule. The PCS Union, which represents civil service workers, has never achieved such a turnout on a national ballot. 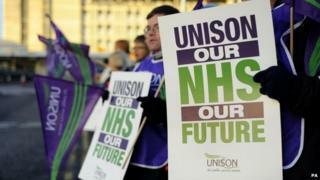 NHS strikes in October 2014 would also have fallen short, with turnouts below 50% from unions including Unison and the GMB. Business Secretary Sajid Javid said: "Trade unions have a constructive role to play in representing their members' interests but our one nation government will balance their rights with those of working people and business. "These changes are being introduced so that strikes only happen when a clear majority of those entitled to vote have done so and all other possibilities have been explored." But TUC general secretary Frances O'Grady said the Bill would "make it almost impossible for workers to exercise what is their democratic right and civil liberty". Ms O'Grady said the changes would enable employers to "stick two fingers up" to workers by bringing in agency staff to break any strikes - and people standing on picket lines would be "subject to arrest". She told the BBC's Victoria Derbyshire programme it would "load the dice" against key public sector workers such as nurses and be "poisonous for industrial relations in the UK". 13 trade unions with political funds are affiliated to the Labour Party and give it substantial sums of money. Unions not affiliated to Labour can give money to any political party they want. Mick Whelan, general secretary of the train drivers' union Aslef, said the move "smacks of Germany in the 1930s" and accused the government of trying to "neuter the unions". Meanwhile, Unite - UK's biggest trade union - has deleted the words "so far as may be lawful" from its constitution. General secretary Len McCluskey said: "Unite is not going to see itself rendered toothless by passively submitting to unjust laws. If the Tories wish to put trade unionism beyond the law, then they must take the consequences." The proposals are being opposed by each of the four MPs bidding to replace Ed Miliband as Labour leader. Liz Kendall said the measures were a "blatant political attack" by the Tories and said she would reverse them if she became prime minister. Andy Burnham said the government was "waging a campaign of demonisation against the unions" while Yvette Cooper said Labour should try to prevent the "divisive and damaging measures from coming into force". Jeremy Corbyn said he would repeal what he called a "naked attack on all working people" if he led a Labour government. Employers' organisation the CBI backed the introduction of strike ballot thresholds. Director general Katja Hall said it was "an important, but fair, step to ensure that strikes have the clear support of the workforce". Adam Marshall, policy and external affairs executive director at the British Chambers of Commerce, said the right to strike "must be exercised with the greatest restraint". Consultations on the 40% strike ballot threshold for key public sectors, picketing rules, and use of agency workers will be open until September. The Conservatives had wanted to introduce the reforms during the coalition government but the move was blocked by the Liberal Democrats. The bill was not debated at its first reading stage, which was its official introduction to Parliament. Strike changes: What do they mean?